【LARGE SCREEN】The table clock has 7 color LED Backlight, Large LCD digital Display, big numbers are easy to read. 【MULTIFUNCTION】Digital clock, time, temperature, date, timer and alarm can be displayed by turn. 【CORLORFUL】7 color changing by pushing the pannel; Press the \"ON\" button at the bottom, it will be always light and accompanied by a 7-color changing. 【TIME &TEMPERATURE CHOICE】Time (12 hours/24 hours); Temperature (Fahrenheit/Celsius desmonstration). 【SNOOZE MODE】The desk clock has snooze function, it is perfect for people who like to sleep late. 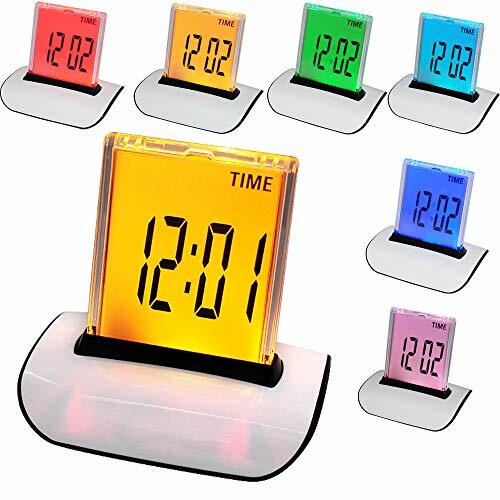 Led color changing alarm clock ! IT'S EVEN GOT A THERMOMETER! BRILLIANT.